On the surface, Japan may look like an immigration-averse country. But while this country is uneasy about the notion of immigration, it is simultaneously host to many non-Japanese people working hard to make lives for themselves in Japan, including housekeepers, caregivers, cooks and spouses of Japanese nationals. Among the most prominent examples is the Filipino community, the growth of which over the years reflects their efforts to integrate with Japanese society, experts and people involved in migration issues say. Lesser known is the recent surge in the number of Nepalese migrants, who are becoming more settled as they seek to carve out lives as cooks and restaurant owners, bringing with them spouses and children from back home. Here we take a closer look at those two communities, with an emphasis on how, in the absence of a clear-cut immigration policy on Japan’s part, they have established — or are trying to establish — lives here. If numbers are any indication, Filipinos appear to have adapted well into Japanese society, establishing families here and working in a range of industries despite the language barrier. Many Filipino and Japanese-Filipino children study at Japanese schools, as there are no schools catering specifically to Filipinos. Government data shows that Filipino residents in Japan totaled 251,934 as of June 2017, making them the third-largest foreign population in the country after those from China and South Korea. The Filipino community is also the largest English-speaking foreign community in Japan, followed by the United States, with 54,918 nationals here. Filipinos overtook Brazilians to occupy the third spot in late 2012 and have since increased in number, with permanent residents — who can stay indefinitely and have no work restrictions — accounting for the largest share. Fifty percent of Filipino residents have permanent resident visas — much higher than the 29.9 percent mark for foreign nationals as a whole. Of the total population of Filipinos, women account for 71.9 percent and men 28.1 percent. According to Marian Jocelyn Tirol-Ignacio, minister and consul general of the Philippine Embassy in Tokyo, Filipino women in their 30s to 50s are mostly permanent residents, with a number of them having entered Japan on entertainer visas in the 1980s and settling here after marrying Japanese men. “There was a very strong pull factor to Japan. Its booming economy attracted a lot of women from the Philippines, as it was easy to earn money,” she said, adding that in just a month the women were able to save enough to build a house back home. But since 2005 the number of visas for entertainers such as singers and dancers has dropped drastically due to toughened rules after some were discovered by the Japanese government to be working as hostesses. Since then many Filipino women have secured Japanese spouse visas and then, after staying here for a lengthy period of time, permanent residency. The Filipino community is not free of adversity, with many facing issues related to their marriages with Japanese men, their visas and citizenship for their children. Virgie Ishihara, head of the Nagoya-based Filipino Migrants Center, said her experience in the 1990s working with Filipino women who suffered domestic violence inspired her to set up the organization in 2000. “Petty things such as rules on garbage become a trigger for fights between couples. So there is a need to make Filipino women more aware about their social obligations and other rules in Japanese society,” Ishihara said. According to Justice Ministry statistics last June, Aichi Prefecture is home to 34,514 Filipino residents — the most of any prefecture in Japan. Due to the presence of major corporations such as Toyota Motor Corp. and its group companies Aichi is a magnet for Filipinos, said Ishihara, as well as those who reside there for other reasons. The low cost of living compared to Tokyo — which ranks second, with 31,940 Filipino residents — has also boosted the size of its Filipino community. 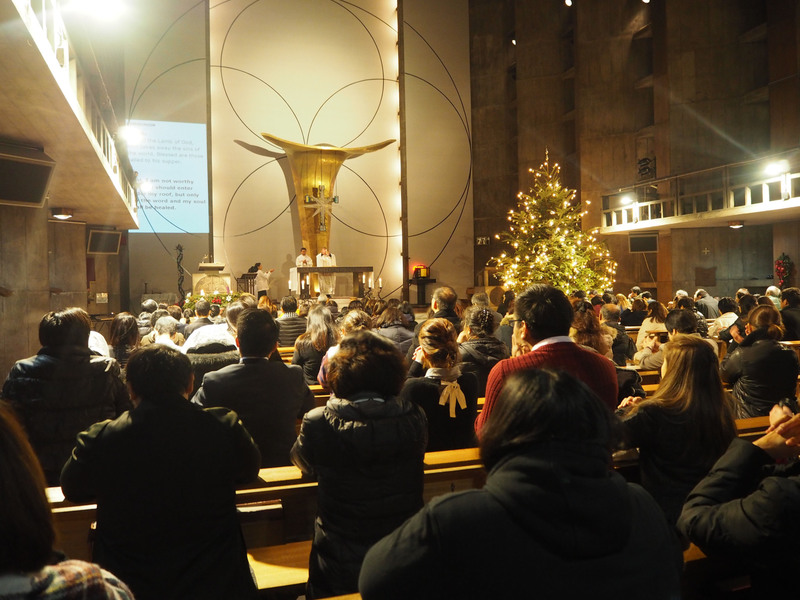 And many Filipinos of Japanese descent awarded long-term resident visas have also opted to stay in Aichi, they said. But data shows that Filipinos have built lives throughout Japan’s 47 prefectures. Even the prefecture with the smallest population, Tottori, is home to 538. Experts say this is unlike Brazilian communities, which tend to stick to one place. “There is no Little Manila,” said Takefumi Terada, a professor of Sophia University’s Faculty of Global Studies who has conducted research into the Filipino community. On the contrary, Filipinos are here for the long haul. They are drawn to the Japanese lifestyle and better wages, which allow them to send more money home to their families. Japan’s proximity to the Philippines, just a 4-hour flight away, is another plus point. Work for Filipinos here is wide-ranging. Men are mostly engineers, information technology professionals and construction workers, while women work in food-related factories or as housekeepers, assistant language teachers and caregivers. “With the aging population and declining birthrate, Japan is left with no other choice but to embrace foreign (nationals). 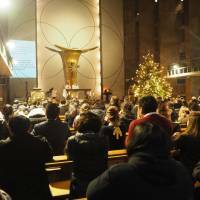 But it is a give-and-take relationship with Filipinos,” said Maria Carmelita Kasuya, a University of Tokyo research associate professor and head of the Gathering for Filipino Groups and Communities, which conducts activities such as charity concerts with a choir of Japan-based Filipinos. Many Filipino communities are built around the church, with Filipinos making up the bulk of parishioners. Caregivers and housekeepers are a new emerging group that is likely to increase, embassy and Filipino civic group members said, due to Japan’s efforts to help professional women reenter the workforce after having children. While there are already Filipino housekeepers working for foreign diplomats and expatriates in Japan, the government has launched a trial program to introduce housekeepers from overseas to families in Tokyo, Osaka and Kanagawa prefectures. The consul general said more than 30 Filipino housekeepers have come from the Philippines under this initiative. But Terada expressed concern over the risks of implementing such a program without having appropriate safeguards for their rights. “That is a big problem,” he said, calling for the need to create a basic law to protect the rights of foreign migrant workers and ensuring fair wages and medical benefits as a minimum. According to Ishihara and Kasuya, Japanese people need to understand that foreign nationals are not competitors in the workplace, and that foreign workers are going to be the new reality in Japan for the foreseeable future. For now, Japan appears to be a go-to location to permanently settle for many Filipinos who are drawn to the country’s economy. But in the end, “it’s not just about work,” Tirol-Ignacio said, referring to the strong ties Filipino women have to the country because of their children and grandchildren. The Nepalese community in Japan has been expanding exponentially over the past few years, driven by an influx of students as well as chefs opening restaurants and their dependents. The number of Nepalese living in Japan stood at 74,300 as of June, spiking from 24,071 at the end of 2012, according to annual statistics compiled by the Justice Ministry. By visa status, students and those on a “skilled labor” visa — often chefs — numbered 24,828 and 12,803, respectively, up from 6,466 and 6,491 in June 2013, government data shows. Dependents have also increased sharply, from 7,797 in June 2013 to 19,516 in June of last year. Experts say a vast majority of students from Nepal come here to work and save money, providing an unofficial and cheap source of labor in Japan’s rapidly shrinking workforce. “The surge in Nepalese migrants to Japan is a fairly recent phenomenon, so they tend not to be recognized as long-term residents,” said Masako Tanaka, a professor at Sophia University who is an expert on Japan’s Nepalese community. “But children brought to Japan on a dependents visa, for example, are fundamentally different from those who are only here temporarily for work purposes. Quite a few families migrate here with the intention of settling, even contemplating the possibility that their children will receive an education in Japan,” she said. 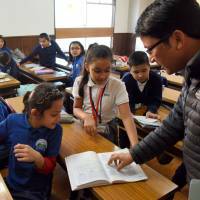 In response to the spike in growth in the community, Everest International School in Tokyo’s Suginami Ward was launched in 2013 by a Tokyo-based nonprofit organization providing educational support to Nepalese students in Japan, becoming the nation’s first international school catering to Nepalese children. What started as a small school accommodating 13 students has quickly grown, with the number of students totaling 170 by mid-December and projected to reach 200 by the end of this fiscal year. Signs instructing students to “speak only in English” are ubiquitous in the school’s building in the Ogikubo district, reflecting the institution’s policy of emulating the all-English curriculum adopted in Nepalese private schools. 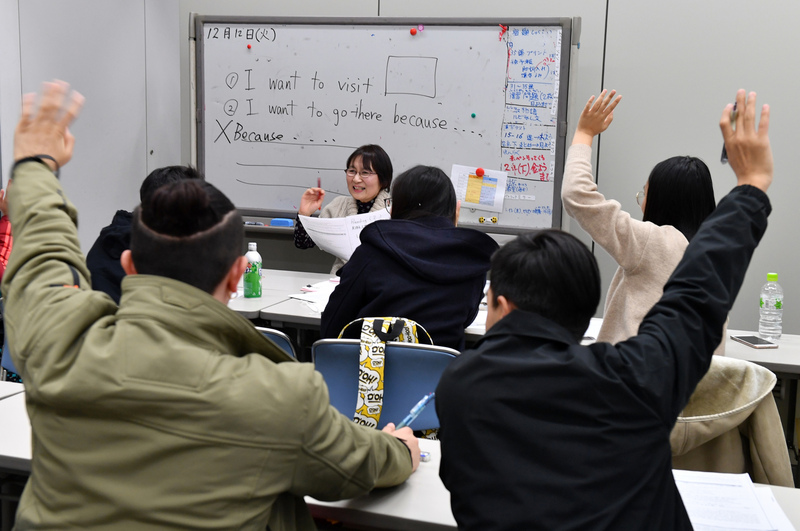 “When we first opened our school many parents thought that their kids’ stay in Japan was just temporary, but nowadays they are increasingly of the opinion that the kids should settle here instead,” spokeswoman Momoko Ozawa said. 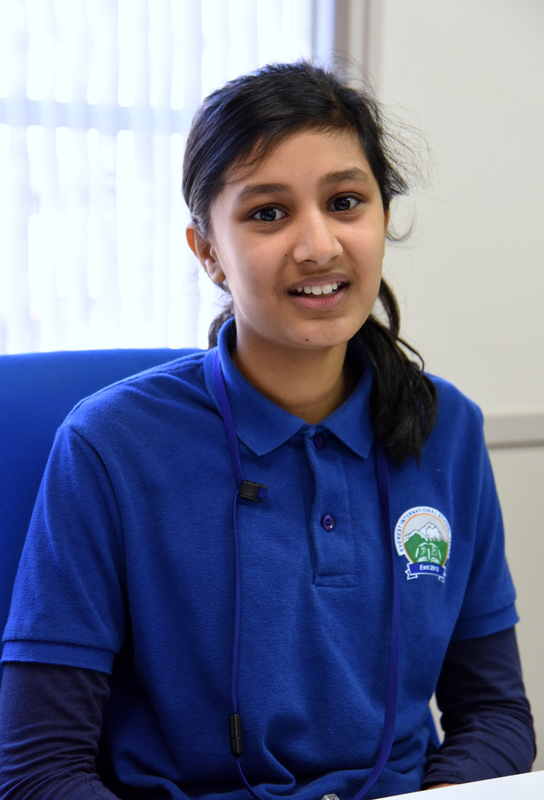 “I imagine myself living in Japan at least until I graduate from high school,” said 11-year-old student Sakura Upadhyaya. Upadhyaya, whose father runs a restaurant, came to Japan at the age of 3 and speaks Japanese fluently. Bisunu Thapa, 17, who goes to a free school run by nonprofit organization Multicultural Center Tokyo in Suginami Ward, said he envisions himself pursuing his future education in Japan, too. 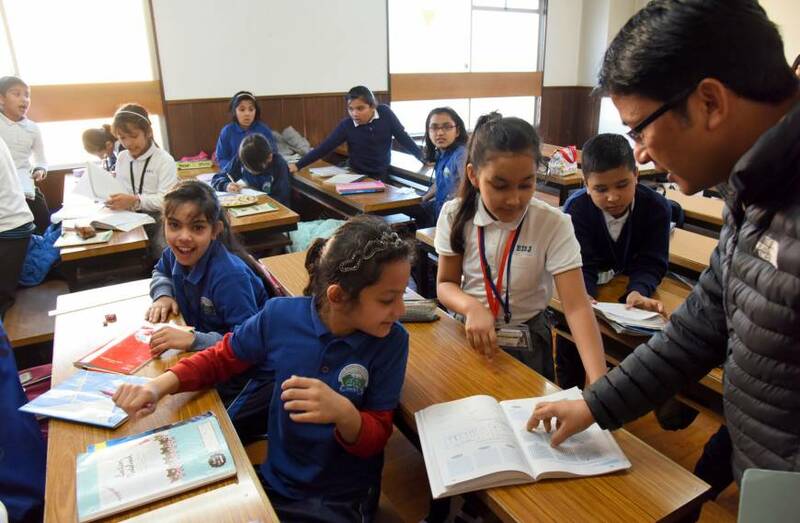 Thapa, whose real name has been withheld by the school for privacy reasons, said he moved to Japan last year following his father’s migration more than 10 years ago and has since busied himself learning Japanese so that he will be accepted by a local high school. Thapa’s father is a restaurateur, too. “Japan is a place where my family has lived for more than 10 years. 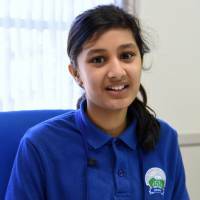 The education level is higher here, the livability is great and there are more job opportunities,” Thapa said through a Nepalese-to-Japanese interpreter. But under the current system, students like Thapa on a dependents visa are essentially banned from working full-time immediately after graduating from high school — a problem that experts say risks making them prone to poverty and marginalizing them from mainstream society. Holders of a dependents visa are not permitted to work more than 28 hours a week, a condition that forces a sizable number of foreign high school students — especially those from Nepal, the Philippines and China — to abandon their aspirations of starting a career upon graduation. They can switch to more stable work visas if they advance to universities and complete higher education, but even then their status as dependents means they are ineligible for state-sponsored student loans. Being denied a chance to work after high school graduation “significantly demoralizes students and can lead to an increase in their dropout rate,” said Hitoshi Tsunoda, who teaches social studies at Hitotsubashi High School in Tokyo and has overseen many foreign students at his school. If left unattended, Tsunoda said, the current visa limitation can lead to the kind of poverty and delinquency that has previously befallen children from marginalized foreign communities in Japan, including those of Japanese-Brazilians who migrated to Japan and also Japanese people who as children remained in China after the war. The Justice Ministry published a notice in 2015 setting out four conditions that, if fulfilled, would lift the ban on minor dependents’ access to work, including that they had undergone “most” of their mandatory education in Japan. But experts argue that non-Japanese children brought to Japan at age 9 or older often experience difficulty being recognized as having spent “most” of their mandatory education in Japan. Retired teacher Toru Takahashi, who now serves as the director of nonprofit group Multicultural Education Network in Kanagawa, pointed out that aspiring “skilled labor” visa-holders, including cooks, are required to have at least 10 years of practical experience in their profession to be granted entry to Japan. Not only that, he said, many don’t bring their families with them until they’ve spent a few years in Japan. “So that means some children, especially the eldest ones, are well over 10 years old by the time they are brought to Japan, and are unable to complete ‘most’ of their mandatory education in Japan,” Takahashi said, slamming the ministry’s bailout measure as out of touch with reality and “toothless.” While Japan accepts restaurant owners and skilled workers like chefs, “the underlying problem is it hardly has any long-term system in place for their families,” said Tsunoda. This is the third in a four-part New Year’s series examining Japan’s immigration policy as the nation struggles with a shortage of workers and an aging population.